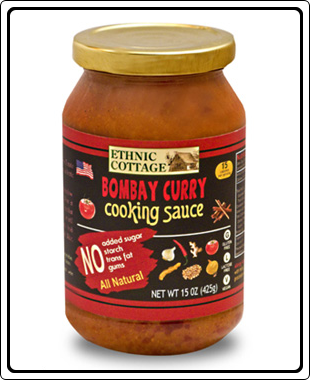 Ethnic Cottage’s Bombay Curry Cooking Sauce is a Tomato based Mild Curry. Makes a wonderful base for an authentic Indian meal. GMO and Preservative Free. Ingredients : Tomato Puree (Tomato paste, Water), Diced Tomatoes in juice, Onions, Fresh Ginger, Fresh Garlic, Lemon Juice from concentrate, Expeller Pressed Canola Oil, Coriander seeds, Cumin seeds, Paprika, Sea salt, Turmeric, Red pepper, Cinnamon, and Cloves. Cooking Directions : Place 2.5 - 3 pounds of boneless (or 4 - 5 lbs on- the-bone) chicken in a skillet. Pour in contents of jar and 8 oz of water. Cooking over medium heat with occasional stirring for 15 - 20 minutes or until the chicken is thoroughly cooked. Garnish with fresh chopped cilantro and serve over warm Basmati Rice, pasta or Pita Bread. Serves 10 - 12.